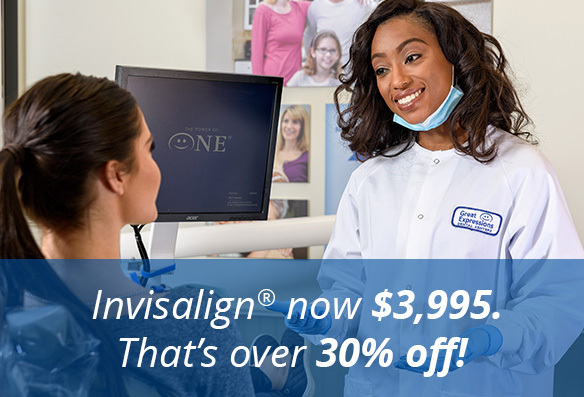 Now, for a limited-time, get Invisalign® at our best-ever pricing of $3,995. Invisalign® is the clear, comfortable, and now much more affordable choice. Virtually invisible—no metal brackets or wires. Removable—keep enjoying all of the foods you love. Effortless care—continue usual brushing and flossing. At Great Expressions®, our dentists receive detailed training to personalize and monitor your Invisalign® experience—and transform your smile! Get started today with special financing through CareCredit! CareCredit is a healthcare credit card that helps you pay for treatments and procedures for you and your family. Promotional Financing for 6, 12, 18, or 24 months** on qualifying purchases of $200 or more with your CareCredit credit card account. *$3,995 LIMITED TIME ONLY: Price shown reflects discount. Discount offer only applies to Full Invisalign® non-discounted rate of $5,995. Fee advertised is a minimum fee only. ADDITIONAL CHARGES MAY BE INCURRED FOR RELATED SERVICES WHICH MAY BE REQUIRED IN INDIVIDUAL CASES. Photograph does not represent services actually performed by the licensee. Actual results may vary. Consultation required and services are subject to clinical judgment. No purchase necessary for consultation. Discount has no cash value, cannot be combined with any other offer, and is not valid on previous purchases. Discount offer is void where prohibited or otherwise restricted. Licensee has the right to end or modify any promotion at any time. Valid at participating Great Expressions Dental Centers® branded locations only. **Subject to credit approval. Minimum monthly payments required. See carecredit.com or ask your provider for details. Offer valid from 12/21/18 to 12/31/2019. Current Dental Terminology (CDT), which includes the Code on Dental Procedures and Nomenclature, is copyright © 2018 by American Dental Association. CDT® is a registered trademark of the American Dental Association (ADA). FL: Licensed and operated by Dr. Robert Brody, DN10219, GENERAL DENTIST. PATIENT HAS THE RIGHT TO REFUSE TO PAY, CANCEL PAYMENT, OR BE REIMBURSED FOR PAYMENT FOR ANY OTHER SERVICE, EXAMINATION, OR TREATMENT THAT IS PERFORMED AS A RESULT OF AND WITHIN 72 HOURS OF RESPONDING TO THE ADVERTISEMENT FOR THE FREE, DISCOUNTED FEE, OR REDUCED FEE SERVICE, EXAMINATION, OR TREATMENT. Great Expressions Dental Centers of New Jersey, PC. NY: Licensed and operated by NY license 049961. GENERAL DENTISTRY. OH: Licensed and operated by Dr. Douglas Dziuba, GENERAL DENTIST. TX: Licensed and operated by Dr. April Kaniera. GENERAL DENTIST.